The author on her inflatable stand-up paddleboard in Humboldt Bay. Looking out at the bay from the Eureka boardwalk, I could barely believe my eyes. In the mist I saw a figure walking on water. He looked mythic, out of biblical times. Could all those Sunday School stories be true, after all? That was a few years ago, and I soon learned the name for the ancient, now modern, sport of stand-up paddling, or SUP (See "Stand Up and Paddle," Oct. 25, 2013). I was attracted to the sport from the get-go, but not to the thought of carrying those heavy, ponderous boards. Since then a new adaptation has arrived on the scene that changes everything: the inflatable stand-up paddleboard (ISUP). My test for investing a chunk of cash in a piece of sports equipment is: Will I use it? Our neighbors' paddleboards are strong and stable, but awkward to transport, whereas most ISUPs can easily be carried by one person using only one arm. 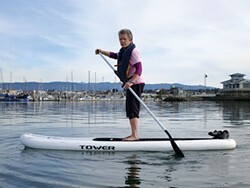 My woman-friendly Adventurer paddleboard from Tower is 9 feet, 10 inches (a foot or two shorter than conventional boards) by 32 inches wide and weighs in at 24 pounds. It takes me three easy minutes to carry it two blocks from our Old Town loft to the C Street dock. No need for schlepping assistance from a car or (worse!) a man. Their lightness is not the only perk. ISUPs roll up compactly and easily fit into a car trunk. No messing with a roof rack. I have not taken my ISUP on a plane, but you could, since it fits into a duffle bag. Also, ISUPs are less fragile than standard fiberglass paddleboards. When inflated to its maximum pressure, which takes six to eight minutes, the ISUP feels surprisingly rigid. It has a soft traction pad on top, which is comfortable on the feet and provides excellent grip. On the other side of the ledger, an ISUP doesn't offer the same trackability and is slightly less stable than a rigid paddleboard. It's a compromise. Although I found ISUPs online for as low as $395, my knowledgeable friends recommended I spend more for a thicker board which would be more stable and float higher in the water so my feet wouldn't stand in a pool of moisture. They aren't always in stock, but you can order one through our local sporting goods shops, too. I waited for a sale and bought a package for $599, which included the board, an adjustable aluminum paddle and a hand pump. A paddleboard offers more viewing possibilities and fitness advantages than a kayak or canoe. Sitting is unhealthy! I already sit at my computer; I don't want to sit while exercising, too. When you paddle, you're working your core, arms, torso and obliques. 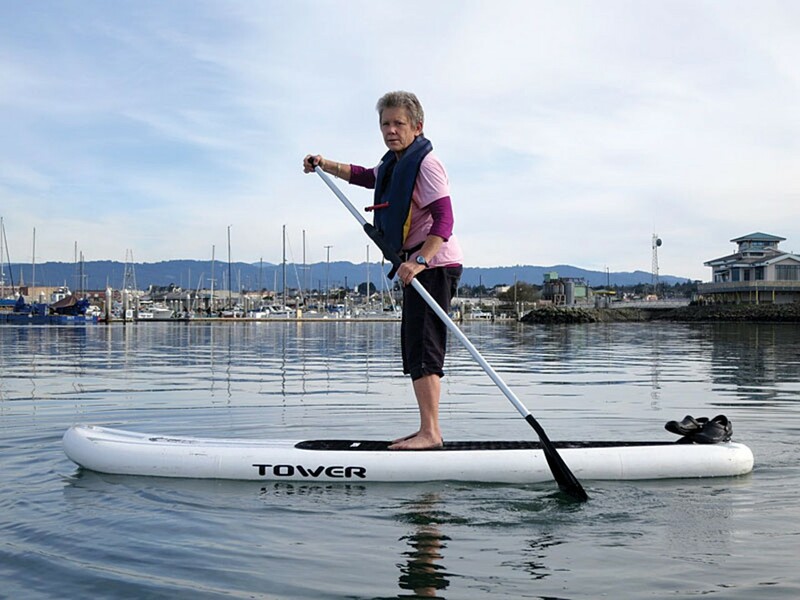 The standing, paddling and balancing required provide a complete workout for anyone, but it's particularly beneficial as we age. The biggest advantage of a paddleboard, though, is getting back on if, worst case, you fall off. I know! I made the mistake of trying to get onto the dock before the paddleboard was right next to it. Now, I kneel, edge the ISUP up close and make sure it's exactly parallel. And I've practiced diving off my board and climbing back on many times, for safety's sake. A typical outing looks like this. Last week I rounded Woodley Island on my "Jesus board," making sure I headed against the current so that on the return trip I could just float back. I passed the Fisherman's Memorial, then paddled along the back of Woodley toward the Samoa Bridge. I sallied back and forth a few times under the bridge, enjoying the view of piers close-up. Watched the cars overhead and the clouds playing tag, feeling far, far away. No one around, other than a seal who accompanied me for awhile. Eventually I came around the north end of Woodley, back under the bridge again and past the marina, the sailboats as still as tombstones. Back at C Street, I stepped onto the dock, lifted the paddleboard, and strode home, waving gleefully at passers-by with my free arm. Less than 40 minutes on water, and completely restored. Louisa Rogers has always thought of herself as a land animal, but is fast becoming a water baby.